Visionen 2018: What happens after leaving school? Apprenticeship, secondary school or perhaps higher education? Intrigued school pupils were once again able to get tailored answers and guidance at this year's vocational training fair in Balingen, "Visions – Possible paths after leaving school" And K+P was there to offer advice. The highly professional vocational training fair, which was held in the Volksbankmesse exhibition centre in Balingen, has now become a major fixture in our events calendar. 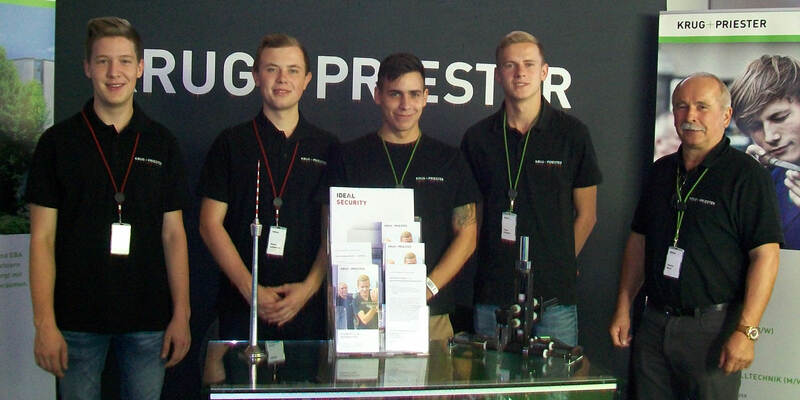 In September 2018, we could be found on site with our eye-catching information stand and our very own apprentices, who – together with Head of Industrial Training Walter Buck – told visitors about our training courses and were on hand to chat and answer wide-ranging questions from interested school pupils on all aspects of K+P. An impressive 130 exhibiting companies and organisations attracted scores of school pupils, teachers and parents to the event. "Events like the "Visionen" are important for us, because training young people is central to our HR development and therefore essential to the continued development of our company. During interviews in our offices, we often discover that a large proportion of young adults actually use this event to gain direct insight. And that's precisely why we are there."